Healthy eating: Is this the ultimate healthy meal? What’s your idea of a perfect meal? Sushi? A large piece of cake followed by hot chocolate? Even if it satisfies your appetite, it’s unlikely to fulfil all your nutritional needs. Eating a variety of foods can also reduce the risk of getting conditions including heart disease, stroke, some cancers, diabetes and osteoporosis. What foods do our bodies need to stay healthy? The foods we need to eat can be divided into five separate groups. How much should we have each day? Why do we need these nutrients? The reason we need a diet drawn from all of the groups is that they all deliver different, but vital, nutritional benefits to our bodies. Fruit and vegetables are one of our main sources of vitamins and minerals, which the body needs to perform a variety of functions well. For instance, vitamin A helps to strengthen our immune system, B vitamins help us process energy from food, vitamin D helps us maintain healthy teeth and bones, and vitamin C helps to keep cells and tissues healthy. The steamed carrots and broccoli, pictured above, will maintain a higher proportion of vitamins than boiled or fried vegetables. Fruit and vegetables (eaten with the skin on) also contain high amounts of fibre which help to maintain a healthy gut and digestive system. Starchy foods, also known as carbohydrates, are where we get most of our energy from. Our bodies convert these foods into glucose which is used as energy either immediately or stored for later use. Carbohydrates also contain fibre (especially wholegrain), and iron which we need to make red blood cells to carry oxygen around the body. Meat fish, eggs and pulses provide us with significant amounts of protein which is essentially a building block of the body. Everything from our hair, muscles, nerves, skin and nails needs protein to build and repair itself. The grilled mackerel, pictured, is an excellent source. Also high in protein are dairy products, and they are also great providers of calcium. The most common mineral in the body, calcium is needed for functions including helping blood to clot, and to build bones and teeth. Fortunately, the fatty and sugary group, the foods that we find the most irresistible, also have a role to play, in moderation. Fat transports the fat-soluble vitamins A, D, E and K around the body. It also cushions and protects the internal organs. Sugar is another food that gives us energy, whether it’s the naturally occurring fructose sugars in fruit or sucrose in table sugar. 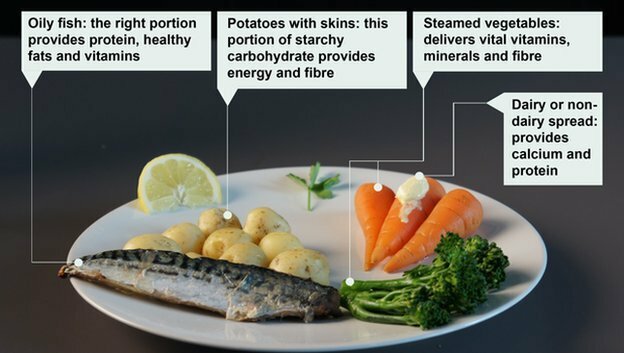 But, “other sources of carbohydrate, for example starchy foods, are a better choice for the nutrients they provide”, says Lydia Kelly, a specialist registered dietician who works for the NHS. Whilst a small amount of sugary foods each day is acceptable, she warns, “eating sugar too frequently may increase risk of tooth decay. Weight gain may also occur if sugar in the diet provides more energy than we are using up”. And many dieticians agree there’s no such thing as a ‘superfood’. The overall balance of the diet is what really matters, and guides such as theEatwell Plate can be helpful. No single food will provide all the nutrients we really need. And neither can one meal – so the plate of food above might be one healthy option, but a good diet should include a wide range of foods from each of the different food groups. Fluids are also vital to help our bodies perform their functions effectively, and the best fluid of all is water. Two-thirds of a healthy human body is actually made up of water. It’s necessary to help our blood carry nutrients and waste around the body and to help the chemical reactions that occur in our cells.